* Unless indicated otherwise, numbers throughout this report exclude the 2012 impairment in Decorative Paints of €2,106 million. 2013 revenue was down 5 percent, mainly due to adverse currency effects and divestments. Operating income was €958 million and included €61 million incidental results. Excluding these, operating income was €897 million (2012: €908 million). Net debt was €769 million lower at €1,529 million (2012: €2,298 million). The performance improvement program exceeded targets and has now successfully been completed, one year ahead of schedule. In addition, we concluded smaller divestments, such as the Primary Amides and Purate businesses, and agreed to sell the German stores in Decorative Paints in 2014. In 2012, Chemicals Pakistan was divested. In 2012, the ongoing businesses of Decorative Paints recorded a goodwill impairment of €2,106 million. An amount of €372 million was recorded for the Decorative Paints business in North America in results from discontinued operations. In this report, impairments from the 2012 numbers are excluded from operating income to present comparable financial outcomes. Full-year average raw material costs were down, having stabilized during the year. The performance improvement program announced in October 2011 has exceeded targets and achieved €545 million in EBITDA for the period 2011 through 2013. This successfully completes the performance improvement program a year ahead of schedule. Further efficiency and cost reduction measures have been identified as part of continuous improvement initiatives which are integrated in the regular business activities. Full-year restructuring costs were €348 million (2012: €292 million) with €204 million in Q4 (2012: €115 million). Full-year revenue in Decorative Paints declined 3 percent compared with 2012 due to adverse currency effects and divestments. Volumes were up 3 percent for the year with increases in all regions except Europe, which was flat overall, reflecting the difficult trading conditions. Margins improved due to margin management and lower raw material prices, both for the full year and the fourth quarter. Q4 revenue was down 6 percent due to the divestment of Building Adhesives and adverse currency effects. Volumes in Q4 were up in all regions, against a low base in 2012. Performance improvement programs and restructuring measures have lowered the cost base by more than 3 percent. Restructuring charges were below the previous year, resulting in higher operating income compared with 2012 before the divestment gain of €198 million on Building Adhesives. Full-year revenue in Europe was down 5 percent. The divestment of Building Adhesives had an impact of 2 percent. Volumes were stronger in Eastern Europe (especially Turkey and Russia), but most countries continued to be impacted by weak demand. Restructuring measures and various operational efficiency improvement programs led to a lower cost base. As a result, operating income was higher than the previous year. In Q4, revenue was down 10 percent due to an impact from divestments (7 percent) and adverse currency effects. Full-year revenue decreased 2 percent, with strong trading development offset by an adverse currency impact, mainly in Brazil and Argentina. Margins improved due to lower raw material costs and improved formulations. Costs increased as a result of additional manpower to support growth. In Q4, revenue was 7 percent down on the previous year, due to adverse currencies, which was partly offset by price/mix. Full-year revenue was up 3 percent, with strong volumes offset by an adverse currency impact in the region. China saw healthy growth in all segments. Profitability increased due to lower costs. In Q4, revenue was up 1 percent due to strong volumes, offset by adverse currencies. Revenue declined 2 percent compared with the previous year, due to adverse currencies and overall flat volumes, but with continued variability between individual segments. Volumes were down at the start of the year compared with 2012 – reflecting the difficult trading conditions – but gradually improved, with Q4 volumes being up 2 percent. Despite higher restructuring costs, margins were stable. Q4 revenue was down 2 percent after a 5 percent currency impact. Restructuring initiatives accelerated, with the intended closure of seven sites located in Europe, Brazil and China being communicated. This resulted in lower operating income compared with 2012. Full-year revenue declined 5 percent, due to adverse currencies and price/mix. Volumes ended flat, with growth in Protective Coatings – especially in the oil and gas segment – whereas volumes declined in Marine and Yacht. Despite higher volumes in Q4, revenue was down 5 percent on the previous year, mainly due to adverse currencies. Full-year revenue was up 2 percent on 2012, driven by price/mix and volumes, with an adverse currency impact. Volumes in the vehicle refinishes market showed recovery in the US and Canada, with growth continuing in Latin America and China. Demand in Western Europe remained weak. Strong customer demand was also experienced in the consumer electronics and aerospace markets. In Q4, revenue increased 1 percent, impacted by adverse currencies. Volume development was in line with the full-year trend. Full-year revenue was 2 percent down on 2012. Positive volumes and price/mix were more than offset by adverse currencies. Europe, the Americas and most high growth markets showed positive results with growth in volumes. Revenue in Q4 was flat due to adverse currency effects and positive volume and price/mix developments. Europe continued its positive trend, with the transportation and general metal finishes sectors performing well. Three intended site closures were announced during the quarter. Full-year revenue declined 3 percent, due to adverse currencies. Overall volumes declined, with growth in Coil Coatings being more than offset by declines in Packaging and Wood. In Q4, revenue declined 3 percent, mainly due to adverse currencies. Volume and price/mix were favorable and, apart from Packaging in North America and Europe, all businesses grew. Four intended site closures were announced during the quarter. It was a year of continued soft demand for Specialty Chemicals, with low activity being particularly evident in construction-related products, pulp bleaching and the plastics industries. In addition to the general slowdown in demand, new plant start-ups and extended maintenance stops earlier in the year impacted production temporarily. The results include a non-cash impairment charge of €139 million on a business held for sale. Focus on cost control and margin management was maintained in all businesses, with a comprehensive performance improvement program being implemented at Functional Chemicals. Revenue in Q4 was down 9 percent, mainly due to the Chemicals Pakistan divestment and adverse currency effects, although volumes rose 3 percent compared with Q4 2012 with higher volumes in most businesses and the absence of the previous year’s production issues. Business conditions remained difficult throughout the year, with continued weak demand from the construction market in Europe and general manufacturing. Full-year revenue was down 5 percent, mainly due to adverse currencies, while volumes were down 1 percent. The performance improvement program is contributing to margin improvement and cost reduction. However, overall profitability was impacted by higher restructuring costs. During the year, the intended phase out of organic peroxides production at the Deventer site in the Netherlands was announced, with capacity being consolidated at other sites. Q4 revenue was down 2 percent compared with the previous year, mainly due to adverse currencies. This was slightly offset by a 4 percent volume increase for the quarter, mainly noticeable at ethylene amines. The divestment of the Primary Amides business was successfully completed during the quarter. Demand during the first half of the year was adversely impacted by an extended maintenance stop, which temporarily impacted production. Overall revenue for 2013 was down 1 percent, with volumes on a par with last year as volumes later in the year improved due to better capacity utilization. Revenue in Q4 was up 1 percent compared with the previous year, primarily on the back of better volumes. It was a challenging year, with revenue down 7 percent, mainly as a result of adverse currencies and the closure of the fatty acid business in Boxing, China. Overall volumes in the Americas were stable, with Asia and Europe being lower. Margin management and cost reduction measures contributed to the overall performance. Q4 revenue was up 2 percent, mainly due to volume improvements in Asia and the US, although Europe remained challenging. 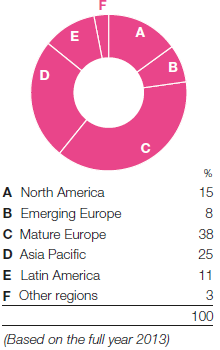 Markets were generally slow in 2013, with mixed patterns across all regions. Revenues were down 10 percent as a result of adverse currencies, divested businesses and lower volumes. Bleaching chemical volumes were slower at the start of the year due to soft demand in the US, but later recovered due to additional capacity at our chemical islands in Brazil and demand from Asia and Europe. Q4 revenue was down 12 percent, impacted by adverse currencies, divested businesses and price pressure. The divestment of the Purate water treatment business was successfully completed during the quarter. Operating income in other activities was lower than the previous year due to pensions. In 2012, there was an one-off gain and in 2013 additional costs were incurred due to the de-risking of the pension liabilities in the US. The year-to-date tax rate is 14 percent (2012: 31 percent excluding the goodwill impairment charge of €2,106 million) due to a non-cash gain as a result of the recognition of previously unrecognized deferred tax assets and several non-taxable items. Excluding these effects, the tax rate is 30 percent. A decrease in cumulative translation reserves of €65 million due to realization of the cumulative translation reserves related to the divested Decorative Paints North America business. Our dividend policy is to pay a stable to rising dividend. We will propose a 2013 final dividend of €1.12 per share, which would make a total 2013 dividend of €1.45 (2012: €1.45) per share. There will be a stock dividend option with cash dividend as default. Please refer to the financial calendar of this report for dividend payment dates. Operating activities in 2013 resulted in cash inflows of €716 million (2012: €737 million). The change is the net impact of higher operating income (excluding impairment) and lower cash outflow from provisions partly offset by lower inflow from working capital, as 2012 had an exceptional impact. The movement in other changes relates to the non-cash impairment, that was included in profit from continuing operations in 2012. The financial outcomes in this report are preliminary and unaudited. The Financial statements for 2013 will be published on February 26, 2014. Except for the implementation of the revised IAS 19 “Employee Benefits”, the accounting principles are as applied in the 2012 financial statements. Incidentals are special charges and benefits, results on acquisitions and divestments, impairment charges, and charges related to major legal, anti-trust, and environmental cases. As of 2013, we apply stricter rules to qualify items as incidental.